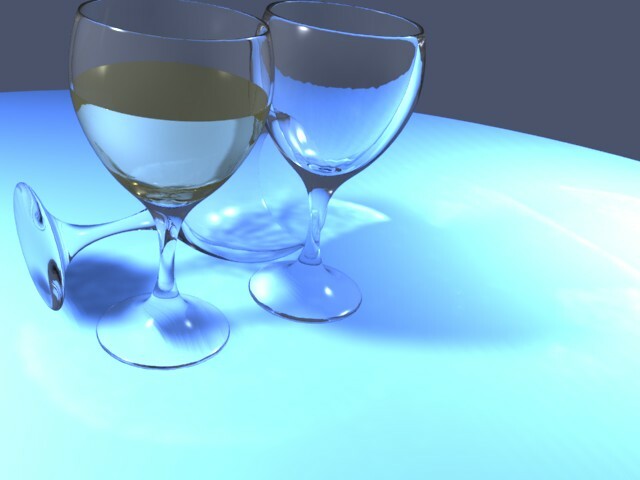 Still playing with yafray and caustics. I thought this render turned out nice but I"m still tweeking. 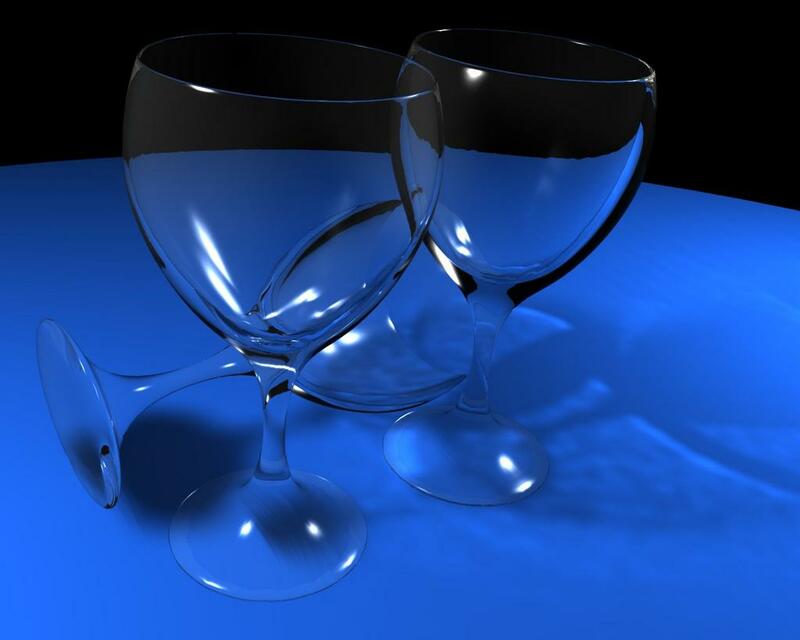 What is the best way to liquid in the glass? take the inside part of your glass, make a copy of it (this way your liquid is exactly the shape of the glass), and give it some color. also, it looks like you need to turn your raydepth up to get rid of those black spots on your glasses. i thought of that same technique with my wine bottles… and woefully it DIDNT work… because the meshes overlaped PERFECTLY… yafray didnt for some reason render the inner mesh of liquid… so i had to scale and distort the mesh to be slightly smaller by the SMALLEST of ammounts to get the liquid to appear. but yes… taking a mold of the inner workings of the glass and going from there is the easiest start. thank you dragonFyre, I’d forgoten about the scaling part. I tried putting wine in one glass but didn’t like how it looked. 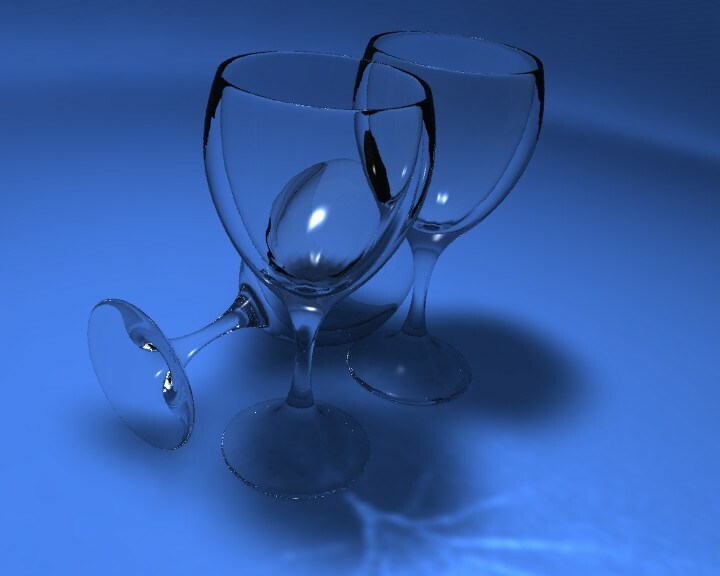 You could always try the Fluid Simulator to fill the glass and then just render whatever frame you think looks best. also need to try an hdri image for your world texture as opposed to just a black world. it darkens your image and hides alot of the shine. alot of people dont realize when rendering an open scene how much the color of the world background effects reflective materials.